Topics: Training & Advice, Recruiter Area, Receptionist, Dispenser, Class Teacher, and Property Lettings Assistant. jobstoday.co.uk jobstoday - Start your Recruitment & Job Search Now! Its 2 nameservers are ns2.johnstonpress.co.uk, and ns1.johnstonpress.co.uk. It is hosted by Johnston Press Plc (England, Leeds,) using httpserver web server. 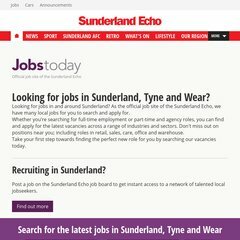 Sunderlandjobstoday.co.uk's server IP number is 195.59.103.168.